It’s all about basic needs. The desire to feel safe is one of these needs. That’s why we can find many products which promise our full security. There are also many devices which keep safe our money, valuables and other special things. People usually choose rather common and standard places to hide their precious things. That’s burglars can usually find all your “secrets” and leave you empty-handed. To protect yourself you’re usually better not keeping valuables at home, but you can’t move everything to the bank! For this case check out the secret socket’s offering. As you can see, this fake socket is a mini safe. I like the idea, but I doubt that it’s the modern way to hide one’s valuables. 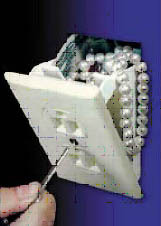 The market offers so many solutions to keep valuable things in a safe that this socket is unlikely to be the best one. Anyway, everybody is free to choose what works best for them. Ok, I can be a bit less strict. Actually, I see the obvious advantage of using this mini safe: the potential thief needs at least a screwdriver to open this. On the other hand, they manage to force open most modern safes. Do you think that they won’t guess how to handle the simple socket? I think I saw this a year or so ago in one of those in-air shopping catalogs next to a fake rock for your garden. By the way, notice the grounds are on top – guess that’s how you inform the thieves where to look. Items of real value probably belongs in a proper safe or in a bank safe deposit box anyway. As the picture demonstrates, it’s really only good for your fake pearls. Which is good, as I never know exactly where to keep my fake pearls!